A small but key place to start infusing more keywords in your resume is to alter the document’s title to match that of the position to which you’re applying. If the job is titled “Pharmaceutical Sales Executive,” this means you insert that exact phrase in the placeholder for your resume’s title. This will both boost your keyword count and demonstrate to your readers what kind of role you are pursuing. Don’t overlook your keyword or skills section in your resume, which you must align with each new position you pursue. As you sift through the job posting, note the key skills and terms which the requisition emphasizes. Compare these to the keyword/skills you have listed in your resume’s summary and revise the latter to match. In addition, revise your summary to reflect these same skills and keywords. Where logical to do so, also insert keyword alternatives that represent different ways to same thing. For example, if the job posting mentions relationship-building, you will certainly want to include that term in your skills list, but you may also want to include the phrase “stakeholder relationship management” in your summary since it means the same thing. Assuming you have included position descriptions for each role listed on your resume, review each one to ensure it mentions the specific skills highlighted in the job posting you are pursuing. Note the goal here isn’t to write long sentences of skills, but to weave your skills into meaty sentences that provide critical context details about each role you’ve held. The same goes for the achievements you showcase underneath each role. Does each one reflect a key skill or responsibility requested in the job posting you are pursuing? Tweak your achievements to insert more skills when relevant. Never assume that your readers will assume you possess a particular skill or experience – always make sure you state it explicitly. If you are applying for management, mid-management, or executive roles, make sure you highlight your strategic planning experience. Clarify when you played a role in devising or executing business strategy and ensure that you describe the role you played. Your verb choice will be important here, as it will signal when you were solely responsible for devising strategy, for example, versus times that you simply contributed to strategy development. Both are important, as is telling your readers which you did when. As you review each position and contrast it with the job posting you are pursuing, also take the time to double-check the scope of authority you describe in each. Is it crystal clear? Did you report to a person of authority whose title it would behoove you to list? Does your job title accurately describe your level of authority? Unfortunately, many job titles are designed for internal use only and do not accurately communicate your scope of authority outside the company. If you face such a situation, you will likely need to add a clarifier to your title to help your readers understand the true scope of the role. One of the most common reasons that you may not get an interview for a job for which you are truly well-qualified is that your resume may prove that you possess too much or not enough experience for the role. Applicant Tracking Systems, or the databases (like LinkedIn) that review your resume, will count the amount of experience described in your resume if asked to seek candidates with X or X to Y amount of experience. In this situation, your resume will be rejected if it proves you have too much or too little, which means you first need to note in the job posting how much experience the company is seeking and then adapt your resume accordingly. If you possess too much experience, remove any reference in your summary to the specific amount and restrict the number of jobs you showcase to those that document the amount sought and no more. The same is also true for education dates, as they, too, can reveal the total amount of experience you possess and thus can inadvertently cause your resume to be rejected on that basis. Remove the dates from all your education, certifications, licensure, and professional development listings unless you’re a new graduate applying for an entry-level job. The process I have just described is not a time-consuming one. If you find yourself scrubbing and rewriting every sentence of your resume or laboring long hours over each tailoring, you are overanalyzing the process. 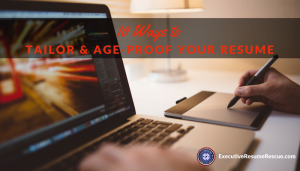 If your resume is well-written to begin with, it shouldn’t require more than 10-15 minutes to tailor it for each new position you apply for, if you have a well-defined job search strategy guiding your job hunt. If you don’t have an effective resume to begin with, are struggling with tailoring your resume, or need help defining your job search strategy, schedule a no-cost, no-obligation review of your situation with an expert Career/Job Search Coach and Master Resume Writer. Excellent advice. I have done a few of these things myself. It is unfortunate that we have to concentrate so much on algorithims. But when you consider that the resume is a tool to get you to the real opportunity to sell yourself, it makes sense.